A collision between a sedan and a pickup truck on a Poway thoroughfare left one person dead Monday afternoon. 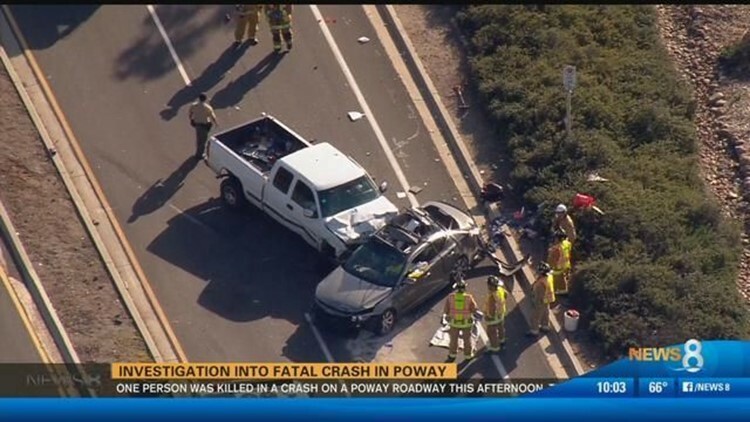 POWAY (CNS) - A collision between a sedan and a pickup truck on a Poway thoroughfare left one person dead Monday afternoon. The crash occurred about 4:30 p.m. on Community Road, just south of Poway Road, according to sheriff's officials. The victim, whose identity was not immediately available, died at the scene of the wreck. No other injuries were reported. The accident forced a closure of the street between Metate Lane and Civic Center Drive, Lt. Damon Blankenbaker said.